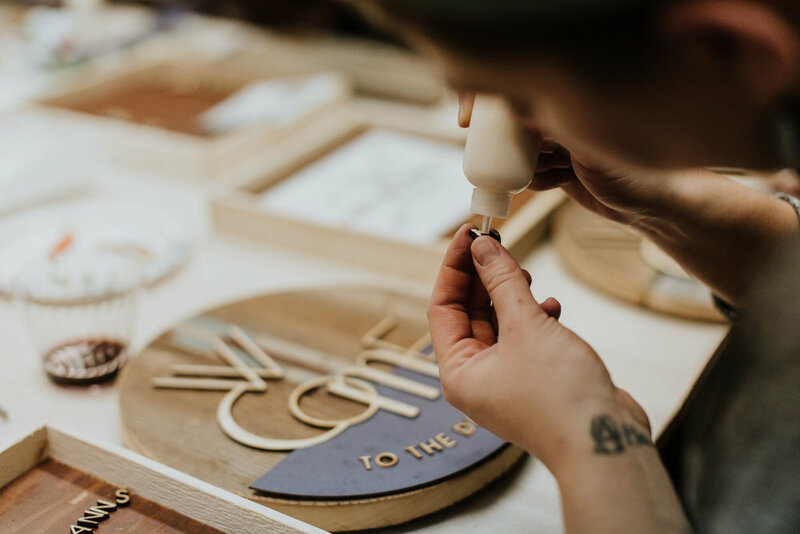 We invite you to join us for the opportunity to create your own unique reclaimed wood art and lasercut décor in a private making session at our Milwaukee studio. Visit our studio for a few hours to make your very own custom wall art and decor with your closest friends and family. Prior to the class, we give you a variety of designs to choose from, so when you arrive everything is ready to go. With our help and guidance we walk you through the making process for our décor to help ensure your project turns out perfect every time. We promise you have all the artistic freedom to pick the reclaimed boards, frames, and papers of your choice so you can incorporate your own design and style. That’s the fun part anyways! Accommodating groups of 2 to 5, ages 15 + due to the steps involved and tools required. We like to keep it small so everyone get’s the attention they deserve. A class for the DIY advocate, fans of repurposing + recyling, and those that simply enjoy making. Set aside 1.5 to 2 hours of time for your session. We provide all the supplies and tools necessary for creating your décor. All you have to do is show up and bring whatever snacks and beverages you’d like to enjoy while you’re here! During our session, you will receive a container with all pre-selected lasercut pieces and templates that you will need to create and perfect your three DIFFERENT designs. We will then walk you through the process. It’s up to you if you keep it all for yourself, or give your décor as gifts! 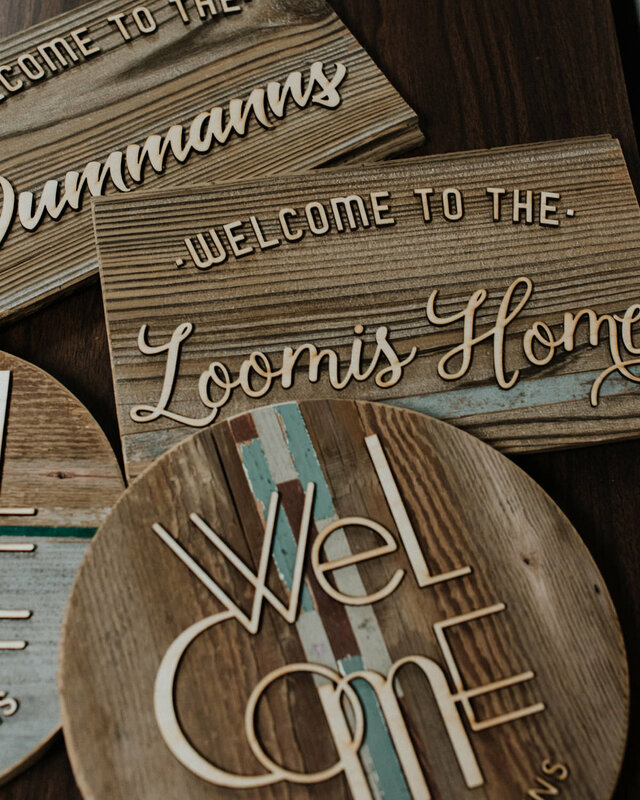 You pick the shape and style of your reclaimed wood sign depending on the custom design you selected for this piece. Styles range from rectangular boards with colored inlays, wood slat circles, or a one of kind weathered board that sells itself. it off with the heart tac to pin “where you love. The options are endless. You choose the lasercut design that you want to mount on your choice of paper inside an 8x10 inch frame. When you arrive, you’ll be able to select your frame and fan through our stacks of paper options to truly design a piece that speaks to you. Opportunity to make and create unique + custom art. 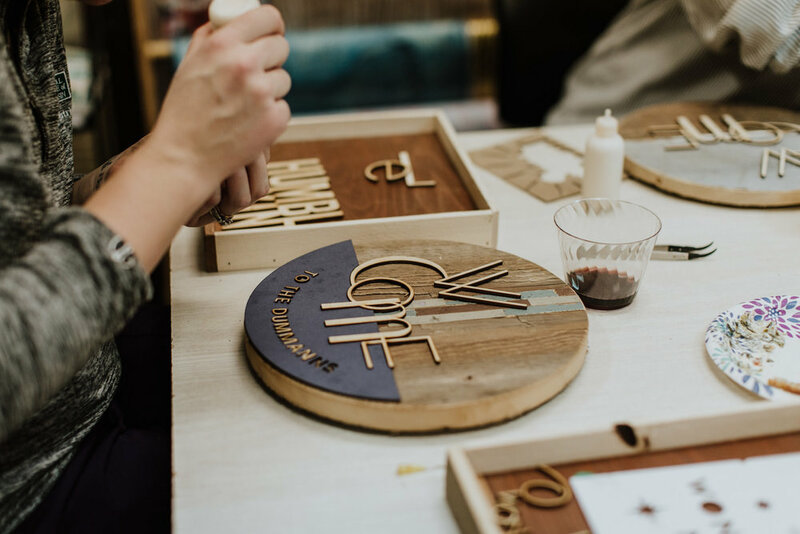 We take the idea of a stenciled or painted sign craft classes to the next level by offering wood lasercut art that you won’t see anywhere else. By signing up for a Makery Session you are supporting your local Woman-owned small business. We love our Milwaukee community and it shines through in our work. From our designs to fundraising and philanthropic efforts, we like to keep the circle revolving. We value the repurposing process and the benefits it has to our environment. We believe in using as many reclaimed and recycled materials as possible in the creation of our products. Gives you a reason to get together with friends + family. Try somethign new, celebrate a birthday or anniversary and walk away with 3 unique pieces!